Edition 1 in the Brainerd/Baxter Strong Town Series. Click here to read the explanatory article for this series. This past weekend I spent a great deal of time in the City of Brainerd, first with my coworkers enjoying a picnic at Gregory Park, then with my family visiting relatives, enjoying the 4th of July parade and fireworks and then attending the Arts in the Park festivities. Throughout this entire weekend I was with throngs of people. Huge crowds. People, people, people. Everywhere. At this point, it is critical to point out two fairly obvious characteristics of these people: they generally had two legs and (my two year old in the stroller as one exception) they were generally walking. Invested in suburban-style development on the periphery of the community. In Brainerd, the car is king. A car can get through town quickly and efficiently, and most therefore do. Those that choose to stop can find a nice place to rest right near the single stop their occupant desires to make. Easy in and easy out. Which makes the 4th of July so interesting. The city pours all of this effort into making it the most successful event possible. It is not sheer patriotism that drives this. It is largely an economic development undertaking. "The Fourth of July Capital of the World" is not a slogan designed to pick a fight with the people of Manchester or Melbourne, it is designed to put Brainerd on the map. Let's bring people to town and show the best side of the city. Then when they are here, we can sell them stuff. Now, I am 100% for bringing people to town and selling them stuff. Let's do it. Some of my future posts in this line of discussion are going to deal with doing that more efficiently and effectively. But for a moment let's just ponder the notion of connecting people with stuff. As I already mentioned, Brainerd has bowed to the automobile in about every way possible. The traffic system is smooth and efficient, designed to move cars in and out quickly and with limited congestion. Let me also mention that Brainerd has a relatively young (median age of 33) population of slightly less than 14,000. So I put these two thoughts together and say, what is so wrong with the residents of Brainerd the it has become necessary to make the city so accommodating to outsiders and their cars? How is it that these people are so deficient that the local merchants don't desire their money, but prefer the money of others from outside the city? Let me put it another way. Brainerd has people. Brainerd has stuff. 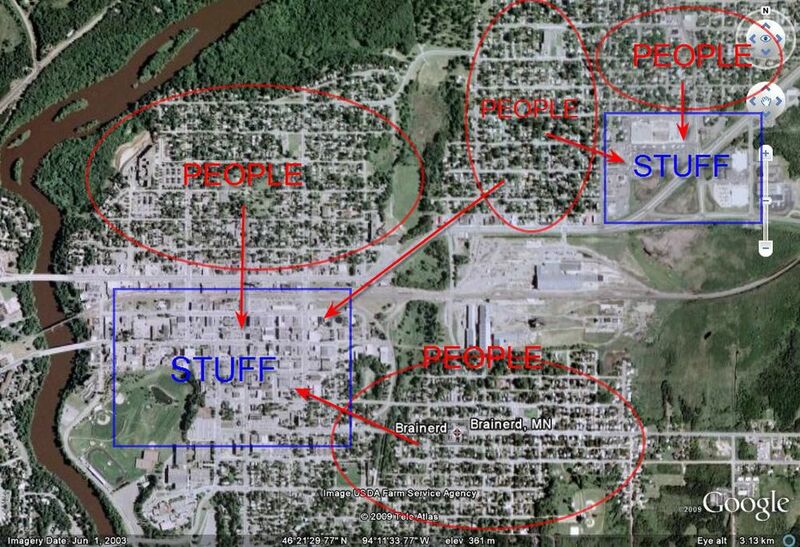 Why does the design and layout of the city isolate the people of Brainerd from the "stuff" of Brainerd? Brainerd has adopted a mindset that prioritizes automobiles over pedestrians. It has done this to try and capture a slice of the action it sees going on around it, which is exclusively auto-oriented. That and because the engineers have told them this is the best way to move cars, which is what a good city does. Because of this, pedestrian life has been practically destroyed. Despite having a young population within easy walking distance of all of the "stuff" Brainerd has to offer, the only time Brainerd sees large throngs of social activity is when they invest money in an event, like the 4th of July, to bring in outsiders, who take over the streets from the cars. When you see pedestrians in Brainerd any other time you assume their car broke down, they are lost or they are indigent. The first step to making Brainerd a Strong Town is for the city to understand its great resource - its people - and start making them the priority, not the automobile. That is a mindset change. I'll gives some specifics on how this change would manifest itself in a future post.